Non-medicinal ingredients: microcrystalline cellulose, sodium stearyl fumarate, hyprolose, silicon dioxide, maltodextrin. Capsule: hypromellose. AOR™ guarantees that all ingredients have been declared on the label. Contains no wheat, gluten, nuts, peanuts, sesame seeds, sulphites, mustard, soy, dairy, eggs, fish, shellfish or any animal byproduct. Pro Destress combines the best nutrients to help you relax, re-focus, and re-energize. It is formulated with three important stress relieving nutrients: L-theanine, holy basil, and GABA. These natural ingredients work fast when you need them, to promote a calm mind without causing drowsiness. The combination of ingredients found in Pro Destress emphasizes a rapid effect as each ingredient is known for its quick absorption and parasympathetic activation. Holy basil has been reported to induce relaxation, promote a feeling of calm and reduce stress for centuries, both as an acute treatment but also to address the underlying dysfunction. While sources of L-theanine have been used for centuries as well, it is only recently, it has been identified as the amino acid associated with increased alpha waves resulting in the calming effect of green tea. Finally GABA is a well understood inhibitory neurotransmitter, prescribed in the treatment of a gamut of nervous system disorders. 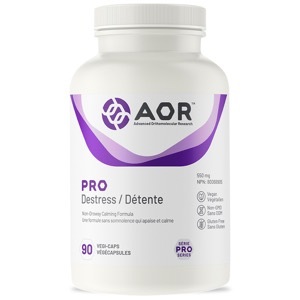 Pro Destress is formulated with the highest doses of L-theanine, holy basil, and GABA. This fast-acting formula is also safe, natural and non-drowsy. Caution: Caution in patients taking heart or blood pressure medication, individuals with a heart condition, diabetes, or if symptoms persist or worsen. Pregnancy/Nursing: Do not use if you are pregnant.